Here's a quick card for the Less is More Challenge week 215 - it's a ONE LAYER week and the theme is to use ANIMALS. I said in my last post I thought my new Bunny Rabbit stamp from Deep Red Rubber would come in useful and guess what, he never made it to the stamp box. Mr Bunny is stamped with Potting Soil Archival as is the Oak House Studio Script Sentiment. To ground him I've blended some Green as Grass Pigment Ink (Oak House Studio) between some ripped paper and then stamped the Daisy and Grass stamps from Crafty Individuals (CI-395) for the foliage. I'm really pleased I found this stamp - used him twice and it's not even Easter yet!! Thanks for visiting and for all your lovely comments. Love that bunny stamp too - you have coloured him beautifully! It's nice to see a realistic rabbit with so many cute stylised versions about - he stands out from the crowd! Great CAS design and your bunny is still perfect! This is really super Elaine! So cute!!! So glad you could play along with AAA Cards. Love how you've created a little scene for your rabbit. Thanks for playing at AAA Cards. 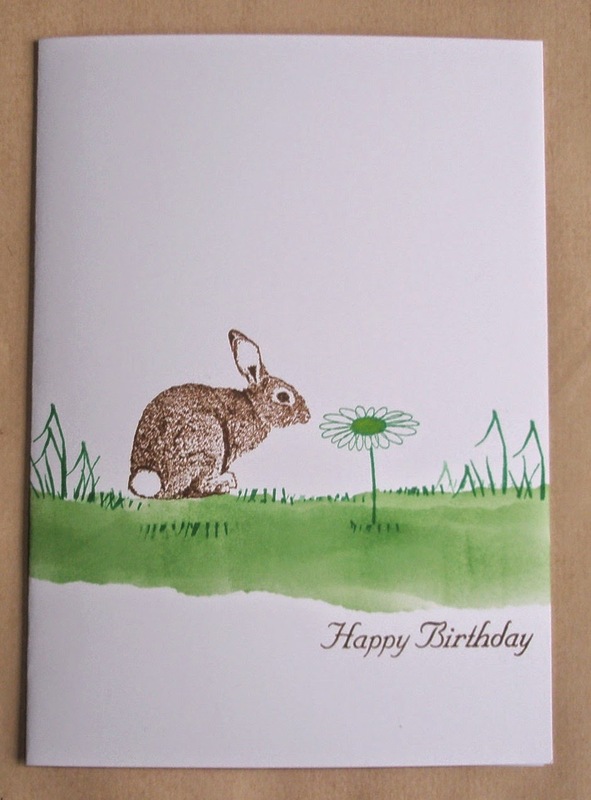 LOVE this bunny....he's sweet and so is your card! Your scene is so sweet, and your coloring is wonderful. Thanks so much for playing along at AAA Cards! thanks for linking up at AAA cards too Elaine. This is my favorite! Love that bunny smelling the daisy! Thanks for joining in CI Challenge this month. Elaine what an adorable spring one layer bunny!